Get Jurassic Park Dinosaurs through Amazon by clicking here! 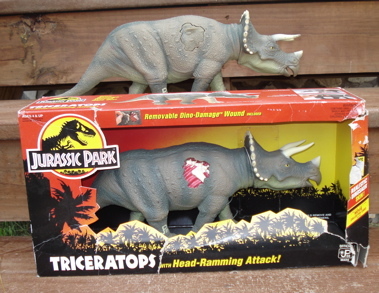 The first Jurassic Park Dinosaurs movie in 1993 began a Dinosaur Toys marketing bonanza. The Jurassic Park Dinosaurs were initially introduced with the opening of each movie and usually based on the Dinosaurs that made their appearance in the relevant film. Since that time new dinosaur toys have been introduced on a yearly basis, flooding a somewhat saturated market. 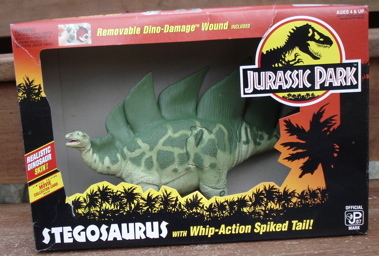 The first series of these Dinosaur toys was introduced in 1993, made by Kenner, and (several) were both quite large in size and covered with what was described as "realistic Dinosaur skin." These are among the very best of the Dinosaur toys...ever. These beautiful toys were both nearly indestructible and yet child-safe. Their bodies are soft and forgiving of falls while being effectively unbreakable. Two important factors in a toy. The following listing will be presented by year of production and "series" through 1997. At that point production sort of got out of hand and after which the list will be simply alphabetical. The list will be added to as I discover (with your help) new (to me) figures. I kind of lost interest in these with the plethora of hard plastic, battery operated and often weird Dinosaur toys that inundated the market. Click here to buy Jurassic Park Dinosaurs from Amazon! 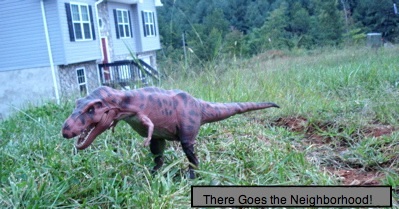 As usual- by clicking on the highlighted Dinosaur name you will get the page describing the Jurassic Park Dinosaurs toy. The Rexford 2010 Blog Archive, all Rexford, all the time. Creation, extinction, the State Fair, the DMV, elections and Christmas, Nothing is safe, nothing is sacred when Rexford gets involved. Here we see the Thrasher T-Rex attacking the Triceratops from an earlier production run. UNDER CONSTRUCTION- the long and varied list of hard-plastic and electronic figures including the "chaos" series and regular Dinosaurs. The Jurassic Period saw some very well known Dinosaurs. The Jurassic Park Dinosaurs cover the Permian through the end of The Cretaceous Period and are not limited to any one period. The best thing about them is that they are meant to be played with and not put up on a shelf to be admired. JP Toys, where you can see lots of pictures and find out more company and product information. 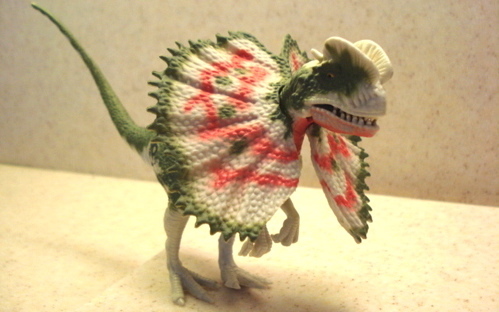 I love these Dinosaur toys and you will see that as you go through the site. Especially "Rexford", the JP.09, who has many adventures as he travels about the countryside. 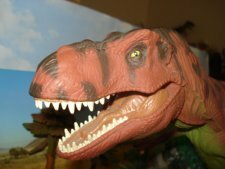 For Other Toy Companies That Make Dinosaur Toys: Click ME!